Robert Purvis was born in South Carolina to a free African American mother and a European American (Scottish) father who sold cotton. He was educated in Philadelphia at the Clarkson School, an institution that the Pennsylvania Abolition Society had established. He also went to Amherst College. As he grew into adulthood, his father passed away, leaving his family with considerable wealth. He married into one of Philadelphia’s leading free black families, the Fortens. 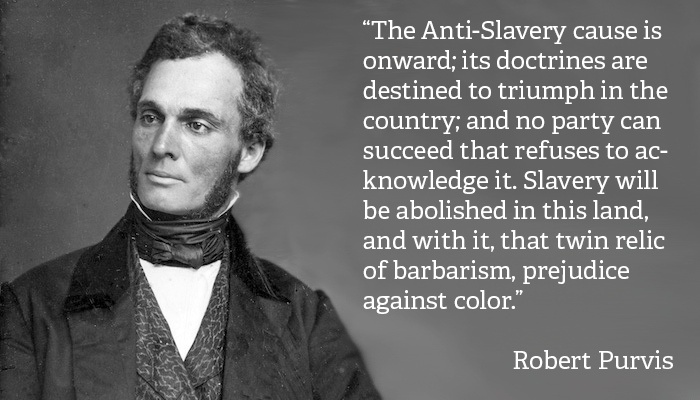 His activities included participation in the American Anti-Slavery Society, created by William Lloyd Garrison, and lecturing in various American cities and across Europe. Purvis dedicated the remainder of his life to important political issues related to African Americans’ experiences during the late period of slavery, the Civil War, and the decades after the war ended. As an abolitionist, he worked hard to harbor runaway slaves, especially as a member of the Philadelphia Vigilance Committee, earning him the title of President of the Underground Railroad. Purvis had connections with both state and national legislative matters. For example, he tried to stop the Pennsylvania legislature from passing a law that would revoke the right of free African men to vote and, later, he opposed the substance of the Fifteenth Amendment because it did not include enfranchisement for all women along with African American men.